U2 are an Irish rock band from Dublin formed in 1976. 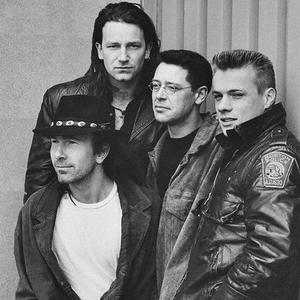 The group consists of Bono (lead vocals and rhythm guitar), the Edge (lead guitar, keyboards, and backing vocals), Adam Clayton (bass guitar), and Larry Mullen Jr. (drums and percussion). Initially rooted in post-punk, U2's musical style evolved throughout their career, yet has maintained an anthemic sound built on Bono's expressive vocals and the Edge's effects-based guitar textures. Their lyrics, often embellished with spiritual imagery, focus on personal and sociopolitical themes.